Mom’s Priority is here to encourage you to live and love fully the people God has put in your life. Marriage is one of God’s best gifts. In all the busyness of raising a family and making ends meet, it is also one of the easiest to let slip. I hope that you will use these resources to enrich your marriage. Above all, enjoy that person that God has given to you to enjoy life with. My husband and I had a day without kids to go see War Room. THIS is the movie every couple needs to see!! Marriage is such a gift, but it has to be made a priority. It is a given that if you spend more years with than without your spouse, that you are going to go through hard times. Couples and singles alike need to know WHO to call on that can help. This is the premise of War Room…a room that this elderly lady Miss Clara goes into when it’s time for the hard work, the “fighting” to be done. What she does in this room- a closet in her house- is pray to the ONE WHO can help! This movie reminds you that we shouldn’t fight each other but rather, let God fight the real enemy for you. War Room reminds you not to look for contentment in your spouse or anything else that the world offers, because it is only temporary; instead, look to God, because HE is the only one who can fulfill you. Many times over, God has proven to our family that He answers prayers, and He not only answers them, He goes above and beyond to take care of us much better than we could ever imagine! 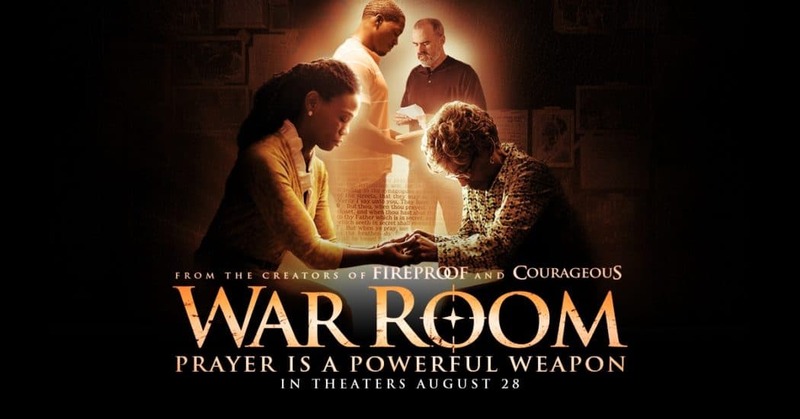 War Room is a must-see for couples, and now they have a prayer guide as well! I heard recently that “Waiting is not Wasting; Waiting is the Work.” God is at work in every situation that you make a priority in your prayer life, and He is a good Father, who loves and takes care of His children. He wants to answer our prayers, especially when it relates to marriage and family. I would love nothing more than for you to make a date with your spouse to watch this movie, and make prayer a priority in your life. It works. For another review, check out Plugged In~War Room!